First off, yes, I count this series as volume one. I know there are some who would say Uncanny X-Men is volume one as its first issue is X-Men 1 and so are all of them until Uncanny 142, but seriously, once Uncanny became the title, then it retroactively became the title, especially once this series came about. Might not be the popular opinion but its mine. I must have read this comic a bunch of times when it first came out. It has a couple sequences that blew my mind and I reread and reread. I was nine, so I was probably a bigger Jim Lee fan and the words were, if there wasn’t too many of them, were in the way. This is one of those comics I had up to sell but then Marvel Comics Database states Magik is in the issue and thus, it is now in my proper collection. Though, the blonde in question could be Magma but I can see where, telling from the hair, that it is Magik. I proudly own the Cyclops and Wolverine cover. It has Cyclops and Wolverine on it, who needs the other ones? Maybe the gatefold cover but I was always happy with the one I have. I feel bad for those who got the Beast / Storm with Xavier in the background cover. My issue comes with the “Things to Come” middle image, I wish I got the one that would eventually be used for the X-Men Forever Alpha two covers, and yes I did buy both covers to that issue. A has Kitty and B, the bottom half of the poster, has Lockheed. X-Men Forever Alpha is the latest I reread this issue, the nice thing was that that collected all three issues, thus setting up the series itself as issue one would have been X-Men 4, if things went Claremont’s way. Alpha came out in May 2009, and with my memory that feels like forever ago, when it was only five years ago. Still, long enough that it needs to be revisited with how many comics I read. I wonder if Claremont, when he turn in the script for this issue, if he knew his 17 year run on the title was coming to an end. Or does that happen closer to two’s script and then he does three for the sake of the story. This also is the beginning of the X-Men Blue and Gold era. Which people love, so much so that when Schism happened, the fonts on books were Blue (for Cyclops) and Gold (for Wolverine). People love those two colors. X-Men Blue was X-Men 1 and X-Men Gold was Uncanny X-Men 281. You tell me which one is the better line up? That’s right, Blue, even if Colossus was swapped out with … anyone else, it would still be the second team. I’m not even sure what made me buy this, I know it was on the stands and thus, I bought it for only $1.50, which is good for me. Well, right now at Mile High Comics, you can get my cover for $9.00 in near mint condition and all the covers, including the gatefold for around $30. Can’t be the highest selling comic in history and not have a billion copies out there. At this time, I’m just enjoying my Excalibur comics, which October 1991 was issue 42, during Alan Davis’ run on the title with Mark Farmer on inks. Good times. Also good? I missed out on a slew of bad 90s comics and X-Events. Most of which, I’ve read summaries on and I didn’t miss out on much. Now that this issue is in my collection, X-Men now starts with issue one, skips to 17, 18, 19, 20 (the Omega Red / Dead Rasputins storyline), then 24 & 25, 30 then I skip until 77 from there the 35th Anniversary era begins and I’m on from 80 – 110. I have 157, 165, 174, 188, 190, 199 to 204 and then Kitty is in space and I’m off the title until it becomes X-Men Legacy and even then, I’m wishy washy on it. I own 61 issues in this series, as I own the Wizard 1/2 issue and Annuals 1995, 1999 and 2000. This is becoming a retrospective on the first issue instead of the last. What I’m saying is that I didn’t follow the title that often a Kitty was off in England, Colossus was mostly in Uncanny and so was his sister. I guess at one point, Colossus joins the Blue Team (or they quit being divided after a year and a half). All of this before even starting the proper review. That’s what you get here at S&FwM, we go above and beyond! Answering questions you never asked and may not have wanted to know. The Blue Team, along with Jean and Storm will make up the 90s X-Men cartoon, which is based on Jim Lee’s designs. Both the Gold and Blue team were living at the mansion, so it must have been awkward with who takes on which cases and battles and when they officially named the members of the teams. There is an ad for Bill & Ted’s Excellent Video Game Adventure on NES and Game Boy. Issue opens with some fugitive mutants being chased by Russians, in space! They do it right in front of Magneto’s recently rebuilt Asteroid M. He gets rid of both of their space ships and takes them all into his page. The mutants are in orange suits and the Russians are in green. The mutants tell him that they want to join him in his mission, he tells them that those days are gone, he just wants to be alone. Due to these actions, Russia wants to proceed with the Magneto Protocols. We see President Bush 41 and Fury discussing Russia’s actions. Fury doesn’t care what they want to do, as long as America can stay out of it. Then the sequence that I mostly think of when I think of the issue. The X-Men want to test out their new defense system. In the control room, is Cyclops, Beast, and Storm as official X-Men. Forge and Banshee (poor Banshee) are support staff. The goal is to be the first X-Man to ‘kill’ Xavier, wins the exercise. Team A is made up of Rogue, Iceman, Archangel and Colossus. Colossus looks so weird not in his armor form but in his uniform. Jean is Xavier’s main defense, that and the defense mechanisms. Jean is wearing the Jim Lee deigned gold and blue uniform that will haunt her for years to come. Xavier is talking about how he is back from a long departure, I believe he was with Lilandra. Jean holds the New Mutants photo. Dani, Wolfsbane, Cannonball, Doug, Shan and Warlock. A Blonde and Xavier are also present. I still say it is Illyana, due to the hairstyle and bust size. Back to the goal. Iceman’s slide keeps melting due to the rockets. Rogue sacrifices herself by having the rockets chase her, and have the rockets destroy the launchers. This knocks her out. Archangel throws Colossus through the window. He’s about to touch Xavier when Jean psychically knocks him out. Team B is Psylocke, Wolverine and Gambit, coming up through the tunnels. Cyclops sends robots after them. Psylocke and Wolverine fight the robots, and Gambit sneaks away. Beast keeps calling Cyclops, Fearless, which starts to bug him after the sixth time. Gambit throws Jean off by throwing an entire deck of cards at her. Then he goes in for a kiss, when he gets to do but the Jean robot explodes. I like how the explosion blows the cap part of the Xavier robot. Cyclops wants to throw a giant truck at Gambit the next time he gets a chance for kissing his Jean. Wolverine claws his way into the control room and extends his claws so that the tip touches Xavier’s head. Cyclops is way angry at Wolverine as the chance of him hurting Xavier is quite high. Wolverine had Psylocke block Wolverine’s presence and that’s how he was able to get as close as he did, he used teamwork. Rogue is mad at Gambit for kissing Jean. Cyclops wants to run another exercise and Wolverine clearly doesn’t. Later, Fury calls the X-Men about the latest Magneto situation. Rogue stands up for Magneto, as at this point, they had a tad bit of a relationship. Cyclops doesn’t trust him, but it makes sense that Storm wants to at least hear Magneto’s side as those two were part of the team when Magneto took over the X-Men. We also see that Moira MacTaggert is on the staff. Right here is the ‘poster’ of ‘Things to Come’ which shows Longsot, the Brood, Omega Red and Sebastian Shaw’s son. Back with Magneto, the Russians are still hating on the mutants. There is something that turns off mutant powers and Magneto himself turns off the Russian’s armor. Magneto comes downstairs, due to all of the shouting. He is wearing white pajama bottoms, a red slash for a belt and a white cloak that is open wide, showing off his chest. If you are well into your 60s, but have the muscular chest of a 20 year old man, you flaunt that to everyone who you can. One of the mutants runs to Magneto and one of the Russian’s suits still works so he shots the girl in the back. This outright disgusts Magneto, and he kills the foolish Russian. Fabian Cortez keeps referring to humans as ‘Flatscans’ so this must be the first appearance of the term, perhaps? Cerebro detects Magneto, so Xavier sends Cyclops’ Blue Team. As Magneto could be anywhere, the X-Men have broken into two teams, Cyclops’ and Storm’s. So the Blue Team, Gambit, Beast, Wolverine, Rogue and Psylocke are heading to the newly rebuilt by Forge, Blackbird. Magneto has gone back to the site of the sunk submarine, Leningrad. A nuclear vessel that Magneto sunk back in the day. Rogue tries to talk to Magneto, due to their shared past. Magneto wants the missiles. Beast and Gambit try the more physical approach and Beast takes a steel rod to the face. Magneto throws Gambit’s cards back at him. This gives Psylocke the opening to Chris Sims’ kick t to the face of Magneto. Unfortunately, Magneto’s costume is really armor, so it takes the blunt of the kick. This still opens Wolverine to violently attack Magneto, drawing blood. This shocks Magneto and Cyclops. 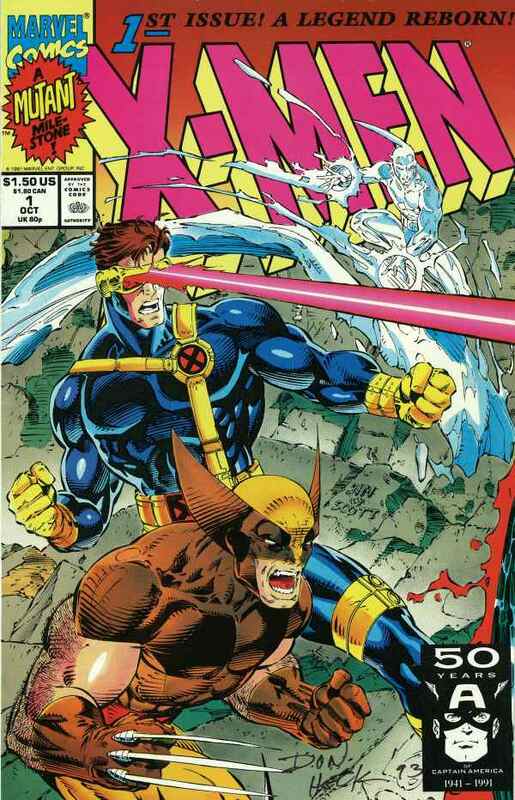 Cyclops thinks Wolverine is entering his berserker fury, so he blasts Magneto away. Magneto ends up in a department of the submarine that the soldiers died in, so there are all of these skeletons, which freaks him out. Magneto flies away with the missiles. Rogue catches up to him and tries to talk with him again. A Russian soldier in a jet opens fire, shooting Rogue in the back. Right when Magneto was rethinking his tactics. So this angers hiim and he sets off one of the nuclear missiles in the upper atmosphere of Russia. 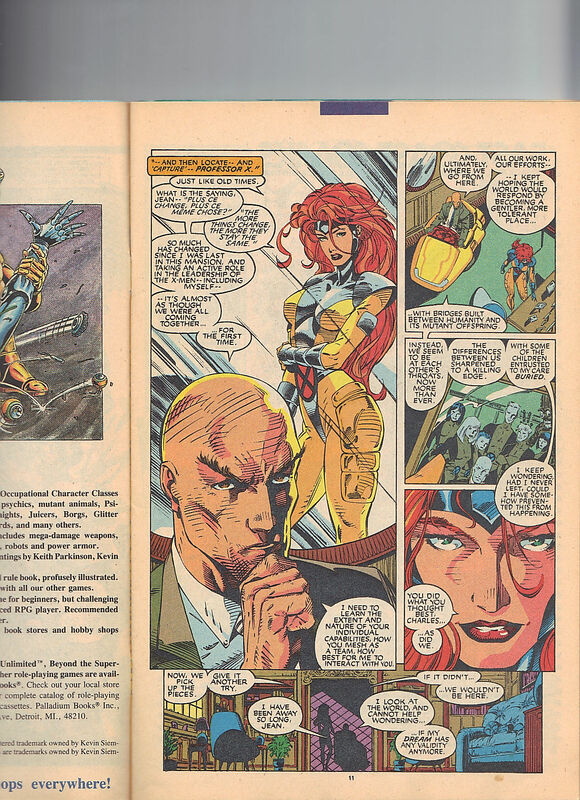 There is an ad for two of Chris Claremont’s novels, First Flight and Grounded. I wonder if they are any good? Back at the base, Magneto is wounded, the cuts are deep. Fabian Cortez will speed up Magneto’s healing. The X-Men are looking for Rogue when Xavier calls them. Rogue is in Genosha. Also there? The newly named, Acolytes. They start killing the Genoshian officers after Rogue turns them down for membership. Genosha has only recently not being racist to mutants but still, the memory of slavery is still fresh. The X-Men show up to stop the killings. Issue ends with Magneto showing up, telling the X-Men that the Acolytes were not operating under his orders but he takes full responsiblity for them. It is a pretty awesome panel though I’m surprised the X-Men allow him to say off of it. Oh 90s X-Men when everyone spoke in giant one page monologues at each other. The very last panel is Moira telling Banshee that everything that is happening is her fault. As I won’t be revealing the next two parts until I get around to reviewing X-Men Forever Alpha, Magneto is only recently a man again. Nanny had turn him into a baby (sort of like how she turn Storm didn’t a child) and Moira had oversaw Magneto’s aging. While she had the opportunity, she tampered with his DNA to make him more understanding. This will annoy him to no end once that is revealed.